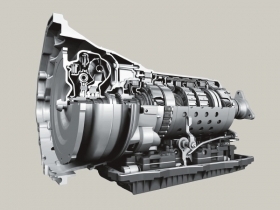 ZF says its 8-speed transmission improves fuel use by 6%. TRAVERSE CITY, Michigan -- Production-ready improvements to transmissions and drivelines could boost fuel-economy by 18 percent on gasoline-powered vehicles and 30 percent on hybrids, said Harald Naunheimer, vice president of corporate research at ZF Friedrichshafen AG. Speaking at the Center for Automotive Research's Management Briefing Seminars here this week, Naunheimer said ZF will have the various new technologies on vehicles by 2010. He said pushing the improvements are lighter materials, more efficient electrical systems that replace heavier mechanical ones and transmissions with more gears. Cosma International is on the same path, finding new chassis applications for lighter-weight magnesium and tubular products, said Swamy Kotagiri, Cosma executive vice president of engineering and research and development. Cosma is a division of Magna International Inc., the largest supplier to automakers in North America. Naunheimer said an eight-speed transmission developed by ZF can improve overall vehicle fuel economy by 6 percent compared to current six-speeds. ZFs electrical power steering adds a 2 percent to 3 percent improvement over hydraulic systems and an electric active roll stabilizer saves another 1 percent to 2 percent, he said. A ZF stop-start function on engines boosts mileage 5 percent, he said. And a light-weight all-wheel-drive transfer case and fuel-efficient axles that use new bearings and technology to reduce friction can boost fuel savings 1 to 1.5 percent each, he said. Youll see these all these technologies on 2010 models, Naunheimer said. He conceded that the technologies may cost somewhat more, though he declined to specify how much. However, the new transmissions, electric steering and the start-stop products are very close in overall cost as their less-efficient predecessors, he said. Kotagiri said the drive for better gas mileage is creating a renewal in interest in such materials as magnesium, which is being used in large parts such as front-end structures. He said the technology is available to take 30 percent to 40 percent of the weight out of chassis with no sacrifice in strength or safety.